With Halloween creeping up on us slowly, relentlessly and with added creepy noises to scare us, it seems only right that we write about it. The season isn't just about dressing up and eating candy / sweets until we're sick, but it's also a time to either embrace scary gaming or, alternatively, find something cute and cuddly to take our minds off of Halloween. Here's the second part of this feature in which more of your Nintendo Life team share their spooky gaming plans. I'm a bit of a grump with Halloween, possibly because I'm 'old' and have a dog that protests at the door being knocked constantly. Nevertheless I can get into the idea of a bit of gaming appropriate for the season, and there are some awesome options kicking around. I plan to try out the free sections of Fatal Frame: Maiden of Black Water before deciding whether to buy it, and I'll be digging out my disc copy of Resident Evil 4: Wii Edition, and I think it's great that it's coming to the eShop in Europe. It's one of my favourite games of all time and I make a point of playing it at least once a year. I will betray Nintendo at least once for a bit of Bloodborne, too. It's been sitting in my backlog for a while but what little I've played has been fabulous, so I want to get into that properly. I normally start my annual Halloween account with a comment or two about how I haven't truly embraced the celebration in the past simply because I am Australian, but I don't know if that excuse truly holds up anymore. From what I can make of it – the truth is – Halloween is steadily growing in popularity down under. Door knocking for candy and chocolate in spooky costumes isn't necessarily an unfamiliar sight on Aussie lawns nowadays. With this in mind, I actually do my best to acknowledge the event's growth each year in Australia by playing appropriately themed video games on the spookiest night of the year. In the past I've jumped on Animal Crossing: New Leaf to trick or treat with Jack, and in more recent times I've dressed my Tomodachi Life residents in a number of scary outfits. This year, however, I've decided to create a spooky themed level in the recent Wii U release, Super Mario Maker. As I'm yet to create a ghost house level with the creator tool, this has become my sole aim this Halloween. Fast forward many hours later and I've managed to create a level titled "Luigi's Other Mansion" which I like to think captures the spirit of the spookiest night of the year and draws inspiration from the original GameCube classic, Luigi's Mansion. So if you're looking for something to do this Halloween, be sure to check it out. Guide Luigi through his other mansion. To be completely honest, I'm a big scardey-cat when it comes to horror. I like monsters, but genuine horror and slasher media is a bit too much for my feeble constitution. This extends from movies to literature and, of course, video games. As interested as I am in plunging into the depths of Project Zero: Maiden of Black Water, I know that I wouldn't last two minutes in the shallow end. Lucky for me, Nintendo understands that even some grown men are afraid of a little jump scare, so they provide some alternatives. I plan on spending my Halloween gaming hours in Animal Crossing: New Leaf. I've spent the past few weeks gathering candy for my villagers and purchasing costumes to hopefully spook them a little, so I feel as prepared as I can be. As much as we obsess over horror when it comes to Halloween, I feel like Animal Crossing is one of the few games that remembers that it's also supposed to be fun, not just terrifying. Halloween is a bit of a funny time for me in terms of gaming picks. I've always loved trying to match playing and re-playing special games up to a sort of seasonal calendar (Attack of the Friday Monsters! and Yumi's Odd Odyssey in the Summer, and Christmas NiGHTS and 1080° Avalanche in Winter, for instance), but I'm normally way too much of a wimp for the obvious Halloween choice: survival horror. That said, this year I'm definitely going to at least dip my toes into the murky, terrifying-looking waters of the latest Fatal Frame. I've got the demo downloaded to my Wii U, and my fiancée and I are planning to turn out the lights and scare ourselves silly on Halloween night! Aside from acting brave long enough to power through those first few chapters of Fatal Frame, my Halloween gaming plans are centered on the not-at-all scary - but entirely seasonally appropriate! - Japanese Rail Sim 3D: Journey to Kyoto. As a big fan of Densha de Go!, Tokyo Bus Guide, and several similar simulators that are way more fun than they sound, I've been having a blast with this eShop train sim, which lets you take control of the Eizan Electric Railway in Kyoto. The centrepiece of the featured line is a section that runs through a natural tunnel of Japanese maple trees, arcing impressively over the track and absolutely exploding in autumn reds and oranges. It's a beautiful sight, and one of the most iconic depictions of autumn I've seen in a game. I finished the game's full-line daytime drive over the summer, so now I'm making it my Hallows' Eve mission to run through the nighttime mode - spooky and seasonal all at once! 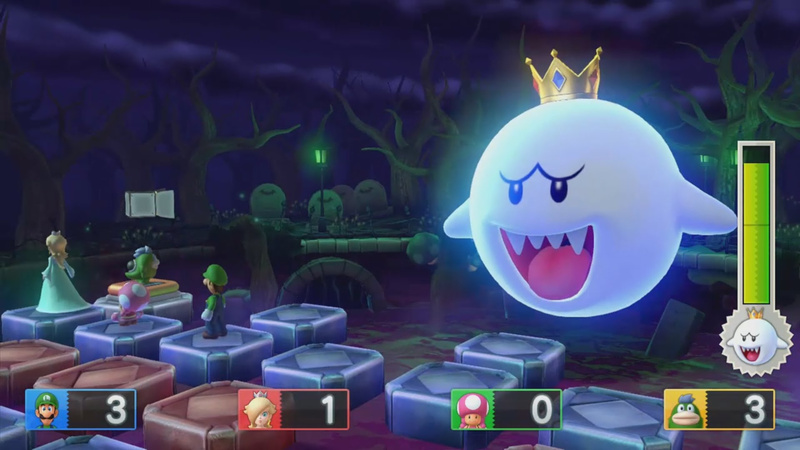 For a couple of Halloweens during our childhoods, my brother, cousin, and I would play the latest Mario Party's ghost-themed map on 50 turns in the dark (I believe this was the max amount of turns you could play back in the day!). Whether this was MP2's Horror Land or MP4's Boo's Haunted Bash, it always made the season feel that much more special. In addition, the house was usually vacant and quiet on this evening due to it being my parents' anniversary (we did have a childminder, but she just let us do our own thing)! Accompany that with mini-games such as MP1's Running of the Bulb, the game felt more of a team adventure against the horrors opposed against us (which included a CPU Luigi on max difficulty). Only once a year did we treat Mario Party as a team game. I know, MP is known for turning family and friends into foes, but Halloween was an exception! This Halloween, we're planning on rekindling this childhood memory of ours and play a Halloween-themed map from one of the Mario Party games (it'll probably be MP10's Haunted Trail). The level of camaraderie probably won't be as existent as our earlier memories, but the nostalgia of playing a Mario Party on the evening of Halloween will be such a cool moment. And best believe there will be a Luigi on max difficulty. ARGH! Though Bloodborne has had my attention lately, I'll probably take a break from being terrified to take part in my town's Halloween festivities in Animal Crossing: New Leaf. Oh, and I'll most certainly be celebrating the end of Inktober by trying out some of the Splatoon stuff I've missed in my time away from the game. Other than that, it'll probably be the usual of playing rounds of Smash Bros. for Wii U and Mario Kart 8 with my friends. I've also been working on a shiny/spooky Halloween-themed team in Pokemon Omega Ruby, so hopefully it comes to fruition before the end of the month. So far I only have my shiny Sableye (the Mega Evolution is beautiful) and shiny Noivern, but I'm hoping to finish that team up. We'll be having a Halloween-themed Pokemon tournament at my place on October 31 so my Pokemon are getting trained up for that. Those are some of our plans, so by all means share yours in the comments! <3 the bit about Luigi on max difficultly and playing Mario Party in the dark. Sounds hilarious. I wanted to get MP10 but the party seemed just as much luck based as MP9, which was a disaster save for the neat mini-games. Fatal frame 5 for the rest of the month! Man, Boo's Haunted Bash sure takes me back. Makes me want to play Mario Party 4 again. I do remember the voiceover lady having a weird Scottish accent though. Maybe I can finally put hours to play Luigi's Mansion 3DS. also playing either RE4 VC or Maiden it the Black Water on the Wii U.
I'll be playing Fatal Frame all week. I started yesterday and will play through a couple of chapters each night so that I'll reach the terrifying conclusion on Halloween. After playing the FF demo (and having it be my 1st ever FF foray) I couldn't help but notice that... its not scary. The scares are extremely tame and I didn't feel any dread or tension. They did a great job with the creepy aspect, but scary, not so much. Also, the controls for the character are clunky. The developers would probably say that the clunky controls are deliberate, to add to the tension. And to them I say,"Bah!" Gonna jump back on the RE Remake. They came very close to gaining a new fan. Turn the scares up to 10 please and you'll win me back. Right now they're hovering around a 4 on the scare-o-meter. I'll be spending Halloween night at a party, so all week I'll be playing Costume Quest 1 and 2, Luigi's Mansion Dark Moon, and Super Castlevania IV. When fatal frame limited edition delivers I'll be playing that! Wow, lot of Animal Crossing goin on. In addition to Fatal Frame, theres's ZombiU and Resident Evil Revelations on Wii U (among some notable indies like Extreme Excorcism and the like), with the very same Resident Evil Revelations and Luigi's Mansion on 3DS. Of course you could also dig into some Wii/DS backlog for many other options, or other consoles for that matter. As for me, I'm playing Fatal Frame, Persona 4 Golden, Triforce Heroes and Tales of Zesteria. @Gen0neD the fatal frame series is about build up. The creep factor builds constantly to the end. Also the first two chapters are lteraly the tutorial. I'm not suggesting you buy this one in particular but you should try one entry to its end at some point in your gaming life. I plan on giving Fatal Frame a try, probably will do a play of Costume Quest 2, and possibly play Simon's Quest. If I had it available, I probably would have tried RE4 again, but Nintendo of America apparently needs lessons. Maybe I'll try to replay through Luigi's Dark Moon, or Majora's Mask 3D. Or I'll look at my backlog on Steam and see if there's any spookey-esqe games that need playing. I see what you did there Tom! For my part, maybe I'll give a try to that FF Limited Edition, or I'll dig into my new PS4 among all those Plus games waiting for me. 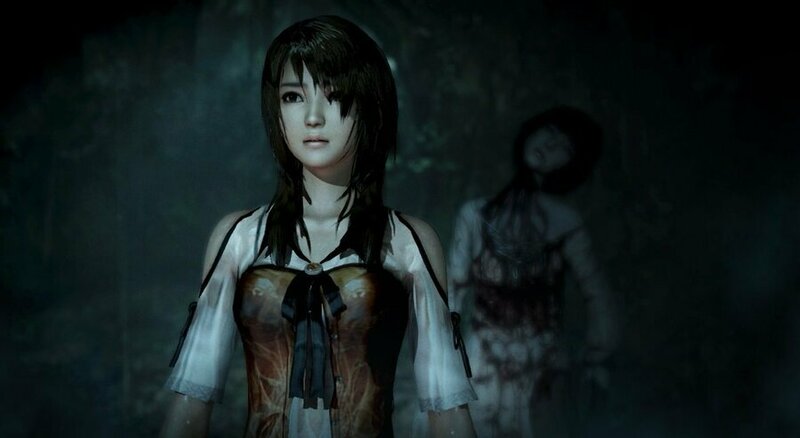 Fatal Frame V looks like Disney's take on the Ringu series. The long haired pale Asian ghost-look is so cliché and overdone. FF Is too clean, polished, anime-fied, pretty and beautiful to ever ever be scary. @faint You know what? I'll do just that. I'll give it a shot. I didn't hate what I was playing. It just felt like a missed opportunity for the devs to scare me witless. Ghosts are a weak point for me. Was hoping to sleep with the lights on. If you say that patience pays off, then I'll give it another go. I believe the answer is Jack Bros. for the Virtual Boy. I mean come on people, the game is literally about Halloween. @King_Johobo I'll probably download the demo eventually, but I can almost guarantee that I won't enjoy it. Do you guys think you could review some more games than usual? Some of the articles (no offense) as of late have been... How do I put this... Kind of pointless? Maybe fillers would be better off with more reviews of what actually IS out rather than speculation and rumors of what IS NOT even in circulation yet. I don't want to come across as rude but rumors are not news. Thx for reminding me! Actually have it on the SNES.